Christmas is just around the corner and I needed two more gifts. 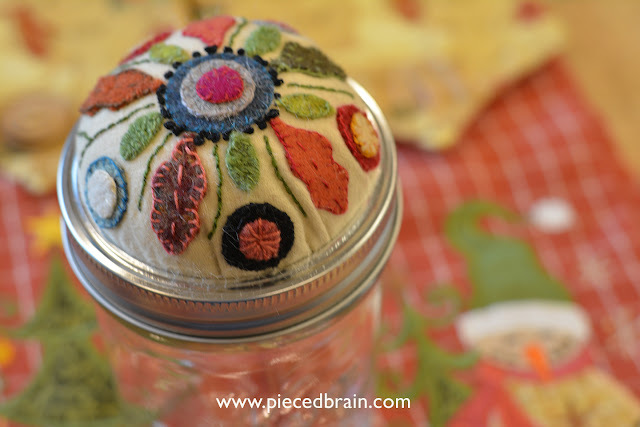 I saw these pincushion jar lids and could not resist them! The embroidery is simple - I am not too good at it yet but I think they turned out lovely! Instead of using wool as a background as the pattern suggested, I used flannel so it would not be too difficult to close the lid once the work was done. Still, the lid does not close all the way but you can turn it once and keep treats safely inside. This is the second one I made varying only the colors of the shapes. At first, I stuffed them well with Polyfill because I like pincushions or anything I stuff with it for that matter, to be filled to the top. Well, I removed some of it to ensure the lid would work. Despite my unsure blanket stitches, I think my friends will like them. 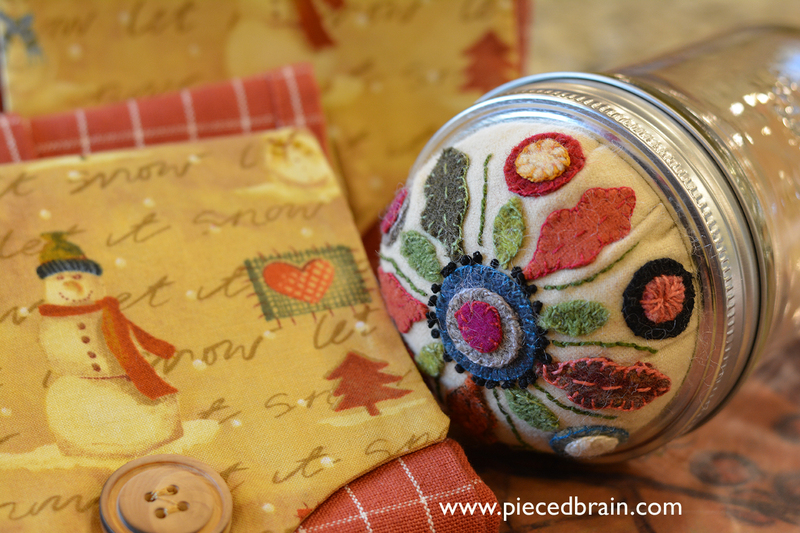 They look great with anything inside, any size of Mason jars (it is for a large mouth jar), in the sewing room or in the den with chocolates, jelly beans, peanut M&Ms (dang, it is barely past breakfast and I already want treats!). 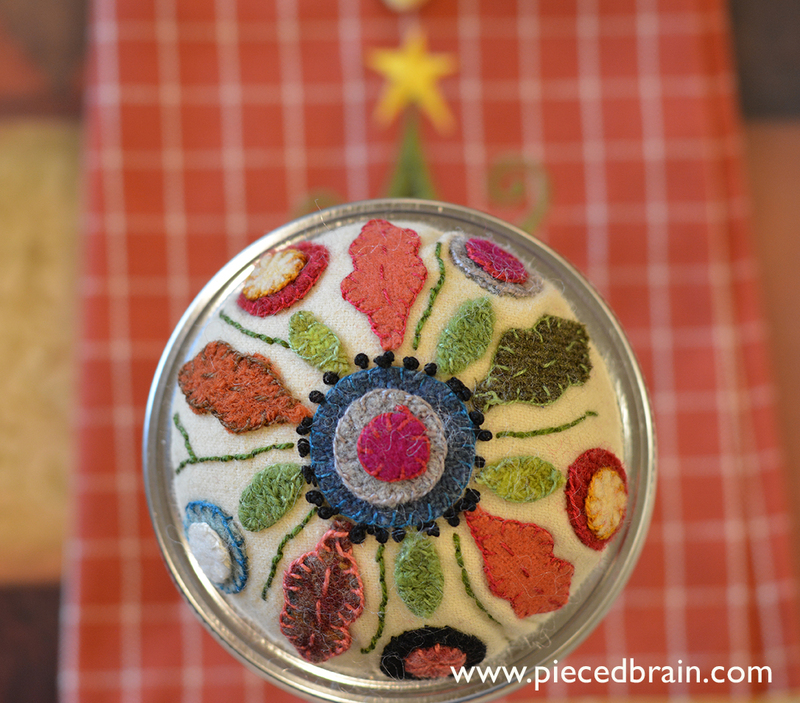 If you haven't embroidered with wool yet this is a perfect project because it is small and fast. I added the vines in between the wool leaves but the pattern did not call for it. 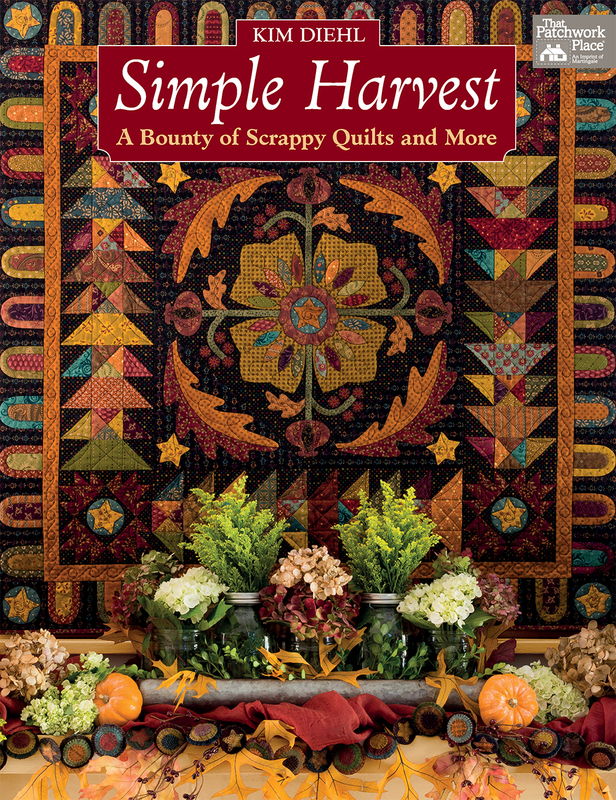 You may have already guessed I got the pattern from one of Kim Diehl's books, her latest "Simple Harvest: A Bounty of Scrappy Quilts and More" by Martingale. 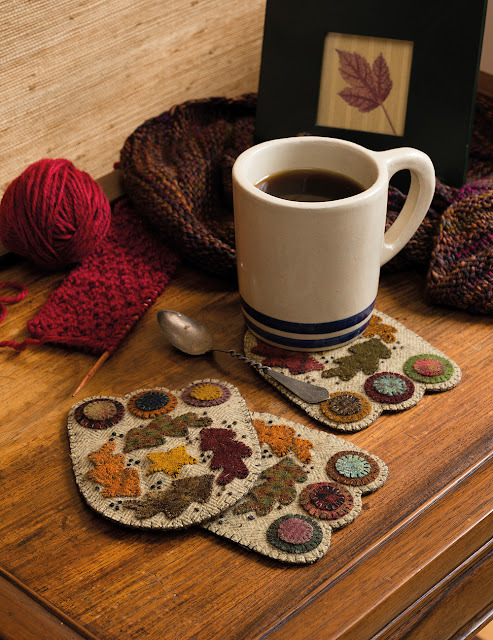 Kim's projects in this book are colorful, full of texture and versatile enough to be gifted year 'round. Photos by Brent Kane for Martingale. Used with permission. Here is another small project: aren't these mug rugs beautiful? They remind me of thick bear paws! The rich palette is enhanced with easy stitches: Kim uses freezer paper and I use Heat'nBond Light (I cover the wool shapes with fabric before fusing them to prevent scorching or making the wool 'shiny'). 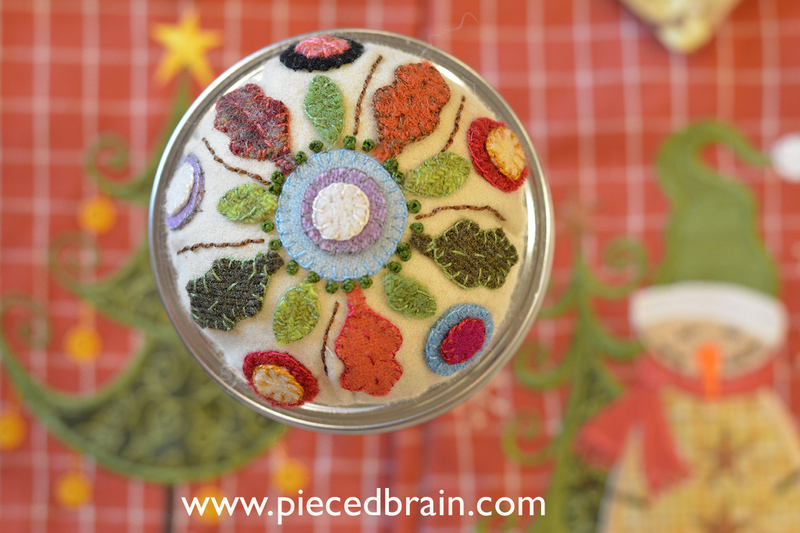 Whichever method you use, this applique' will not take long. 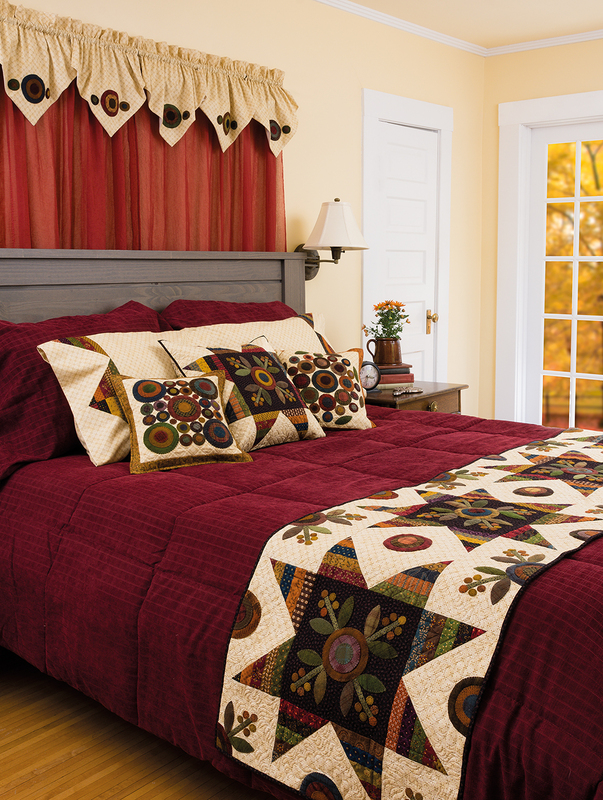 I like the quilts which mix piecing and applique'. 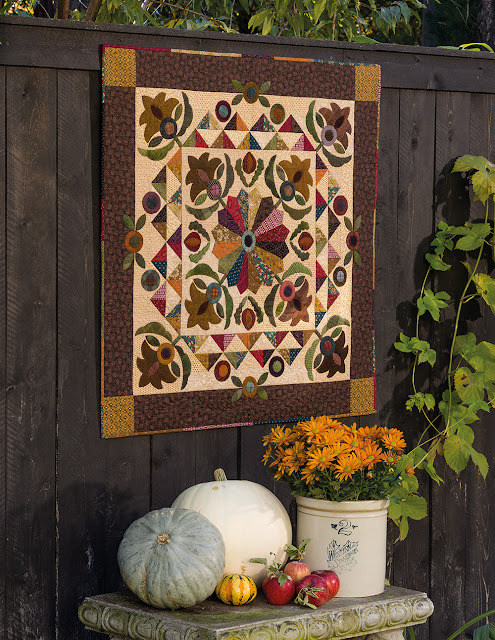 In "Dresden Dish Garden Quilt" above Kim uses cotton and wool to create a gorgeous design, well suited as a welcome wall hanging or a table topper. 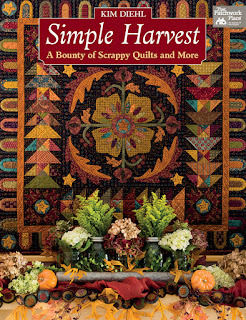 Now, if you will excuse me, I need to bind a huge quilt, add a hanging sleeve to its back, and ship it to a magazine. 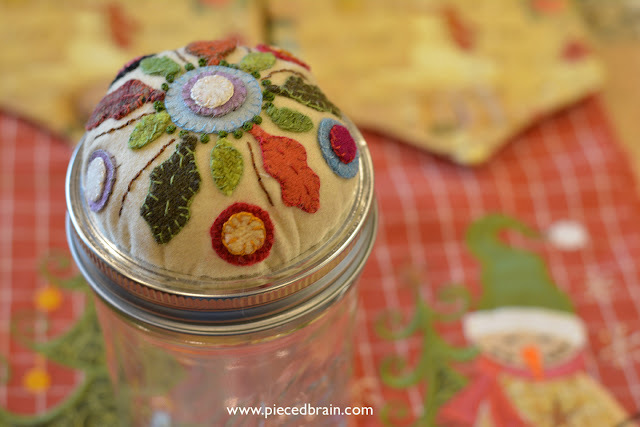 Yes, I procrastinated finishing this quilt by working on these two jar lids. Oh, but I am starting the week much more relaxed and, for that, I thank Kim Diehl and her creative talent. I love those wool lids! Just my kind of hand work project! In fact I just made and posted a wool pincushion too. So fun to wotk with wool. I've only worked with wool a couple times, but I love seeing how creative people do things with it. These pincushions turned out great! Nice work!